Red n'black I dress eagle on my chest. It's good to be ALBANIAN. Keep my head up high for that flag I die. I'm proud to be ALBANIAN. This is a fan blog! Krasniqi rejects 16 Sep offer! Krasniqi: It was not a refusal! NEXT FIGHT: Krasniqi vs Dimitrenko, 15th November 2008, Burg-Waechter Castello, Düsseldorf, Germany ON! LAST FIGHT: Krasniqi vs Thompson, 14 July 2007, Hamburg, Germany! televised live by ZDF German Channel. Luan lost by TKO round (5)! You can contribute by leaving your comments! Kontribuoni duke lene komentin tuaj (kritikat poashtu) shqip apo anglisht! On the July 14 "Universum Champions Night" at the Color Line Arena in Hamburg, Universum heavyweight Luan Krasniqi (30-2-1, 14 KOs) will collide with Tony "The Tiger" Thompson (29-1, 17 KOs) in a WBO eliminator that will produce the mandatory challenger for champion Sultan Ibragimov. 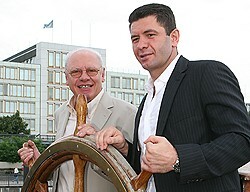 "I'm happy to again fight in Hamburg, especially in an eliminator against Thompson," said Krasniqi today at a press conference taking place aboard the "Rickermer Rickmers," a fully-rigged ship anchored in Hamburg Harbour. "I expect him to be a dangerous opponent. He isn't the quickest, but he has an unwieldy style of boxing. However, I will be fully prepared to step into the ring and compile a victory bit by bit." 'The Lion' Krasniqi is extremely focused on his next task. "Thompson is the next opponent and I must first clear him out of the way," "Other than that, I'm not thinking about anything else." For Krasniqi, the fight represents a chance for a second opportunity to become the first German since Max Schmeling to win a heavyweight title. In his first title challenge, in a dramatic fight on September 25, 2005 at the same arena (on the 100th birthday of Max Schmeling) Krasniqi was ahead to points when he lost in round nine to then-world champion Lamon Brewster by what Krasniqi terms "a lucky punch." Universum promoter Klaus-Peter Kohl is optimistic about Krasniqi's chances. "For Luan a lot is going on. Naturally we want to remain on course for the world championship and this [fight] is particularly interesting for Hamburg." Leni komentin tuaj me poshte! Legenda Music Video - "Kampioni"
Minto: "You have to take chances to get anywhere"
Minto: I have to knock him out!